My mom’s first project was cut from this pattern. I’m a third generation home sewist. [i] My grandmother lived through the Great Depression and the Second World War—the height of the make do and mend movement—and made clothes for herself and her family with such skill that they were indistinguishable from store-bought items yet came at a fraction of the cost. My mother started sewing in 1970 at age 11 when it became clear that the family’s clothing budget couldn’t possibly keep up with her desire to dress like Goldie Hawn on Laugh In. My mom remembers her first project vividly: After choosing a pattern (a shift dress with short sleeves and a Peter Pan collar) she laid out the paper pattern pieces and cut the fabric—the dress was made from fabric salvaged from the skirt of one of my grandma’s old dresses—and then sewed the pieces together, though she had to pick out the side seam and re-sew it eleven times before it was straight. In the end, though, she got the Goldie Hawn dress of her dreams and the skills to have a wardrobe of fashion-forward clothes at a fraction of the cost of store-bought. My mother, like countless women, since the sewing machine first emerged for sale over a hundred years before, sewed her own clothes so that she could participate in and gain entry into a consumer fashion market that was beyond her financial means. The desire for fashionable clothes that were otherwise prohibitively expensive was a significant motivation for home sewing from its inception in the 1860s and 70s until the early 1990s when foreign manufacturing made ready-to-wear fashion dramatically cheaper. When I started sewing in the early 2000s, the pastime was thoroughly passé, but this has changed in recent years as sewing has experienced a resurgence. This resurgence, however, comes with a major shift; home sewing appears to be characterized less by women wanting into the consumer fashion market and more about opting out. A graded pattern has multiple sizes on the same pattern. Using fashion as an expression of class and individual taste is nothing new. However, in the nineteenth century, the Industrial Revolution that started in England and spread to Europe and North America made textiles and trimmings more affordable. Simultaneously, the growing middle class imitated the fashions of the wealthy and intensified the use of clothing as an indicator of social class, taste, and respectability, but the styles of the nineteenth century were complex and therefore difficult to sew and fit, so most clothing was either made to order at a relatively expensive cost or was sewn by hand at home. That all changed after the introduction of home sewing machines and multi-size paper patterns in the mid-nineteenth century. The first commercially successful home sewing machine was made and marketed by Issac Singer in the United States in 1851, but imitators soon emerged and local alternatives were widely available by the 1860s. The sewing machine made home dressmaking faster and the creation of more elaborate styles feasible, and although the machines were costly at first, the sewing machine put fashionable clothing within the reach of more women than ever before. Paper patterns like the ones sold today also emerged in the 1860s and revolutionized home sewing by making fitting easier and expanded to include patterns for children’s clothing, nightwear, and men’s shirts. 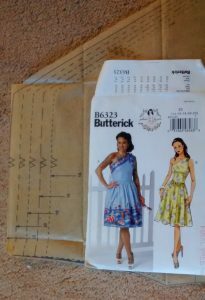 Prior to the advent of the multi-size paper patterns pioneered by Ebenezer Butterick, patterns came in one size and only women with the skill and knowledge to “grade” a pattern to the correct size could use them. 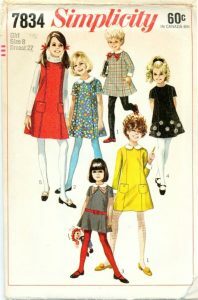 Butterick’s patterns were already graded which made fitting much easier and his success spawned a host of other pattern publishers both in the United States and abroad. By the turn of the twentieth century, women could purchase patterns from a company showroom, fashion magazines like The Delineator and Ladies’ Home Journal, or from a department store like Eaton’s. With access to fashionable patterns and affordable dress goods, middle-class women could have more elaborate and plentiful wardrobes while spending considerably less. The practice of using sewing as a way to participate in mainstream fashion on a budget persisted well into the twentieth century until globalization rendered ready-to-wear uncontestably more affordable. 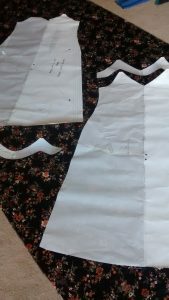 A pattern laid out and ready for cutting. In recent years, home sewing has experienced a resurgence in popularity but with a fundamental shift. Unlike before, home sewing cannot be explained by the desire to participate in mainstream fashion without breaking the bank. After all, consumer fashion is cheaper and more plentiful than ever before, while sewing machines, fabric, notions, and patterns can be prohibitively expensive. For most women—and a growing number of men, sewing is no longer a necessary point of access to consumer fashion but a means of changing the way they consume fashion through increased mindfulness, often with an eye toward greater authenticity and self-expression. The growing “slow fashion” movement encourages consumers to be more mindful of the environmental and human cost of cheap fashion and to reject these disposable garments in favour of fewer, higher quality pieces, an ethos that fits well with sewing, especially since pieces from slow fashion manufacturers are often pricey. Other women are reacting to the fact that a lot of fast fashion simply isn’t made for them. For instance, the Curvy Sewing Collective is a community of plus-size bloggers who provide a wealth of information so that likeminded women can avoid the frustration of the “exclusionary sizing and unimaginative designs of ready-to-wear fashion” and create clothing that is stylish and well-fitted. Similarly, indie pattern designers like Gretchen “Gertie” Hirsch are making sewing as hip and inclusive as possible. For me, it’s a little bit of everything. I don’t like constantly repairing poorly-made items or tossing them after three washes and sometimes clothes shopping can seem like an absurd exercise. This year, when retailers shattered my dreams of a summer spent in bias cut slip dresses, like millions of women before me, I pulled out my sewing machine. Unlike these women though, I didn’t do it because I wanted in on mainstream consumer fashion. I did it because I wanted out. [i] The term “sewist” combines the words “sewer” and “artist” and helps differentiate those who sew at home as professional seamstresses and tailors. It also has the advantage of not having the same spelling as the word for wastewater conduit. Love your article and photos – brought back many memories. Sewing runs in my family too. My grandmother sewed aprons and sold them at the Kingston farmers market during the depression. I have a wedding ring quilt top that she made from the scraps. My mother did dressmaking when we were Young because she could do it at home. She only ever had a green Elna sewing machine which was her treasure – the Cadillac of sewing machines at the time. I learned to use that machine starting when I was about 8 years old. I got an Elna when I was ready to invest in a new sewing machine. Still use it but not enough these days.